The Terran mirror match up early game has become quite stagnate because of the Tank and Medivac combination. There are some signs that players have been trying out more economical openings as a metagame response, and it occurs to me that people have misconceptions of how to deal with these openings. There are two mainstream openings in Terran mirror now. One is a one Barracks Reaper expand, and the other is multiple Barracks Reaper. Clearly, the latter has to rely more on the map features than the former, and it is the former that sets the foundation of the current metagame. The opening is considered the best in terms of converging to the Tank Medivac combination as smoothly as possible with various things considered. Just to show a recent vod of this one Barracks Reaper expand opening below. I won’t go too much into it since I have already discussed this paradigm shift in TvT early game in another post. The key take away is the flexibility of this build. It can mix in different offensive options like Widow Mine drop, and also react defensively well against multiple Barracks Reaper and gas first builds. The vod shows how Journey reacts to Taeja’s gas first Banshee, Hellion and Marine build by getting Cyclone and Viking. This leads to a minor metagame opening adjustment that opens up slightly more economical than this Reaper expand. The current Reaper expand build can be considered a middle of the road build that does not have a strong early game attack option. This opens up the possibility of getting ahead against this build by being slightly more economical. It is based on the fundamental logic of defensive > offensive > economical > defensive. I have previously written about how to play against an economical build by being even more economical based on this basic logic. You can open up slightly more economically by using a gasless opening (e.g., one Barracks gasless expand and Command Centre first). 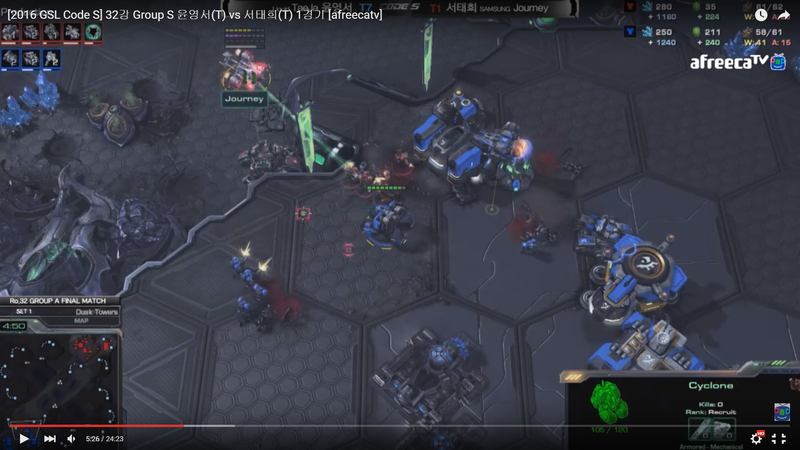 Taeja actually went for a one Barracks gasless expand against Journey in the vod below. Taeja’s Command Centre is earlier, but his tech is delayed. 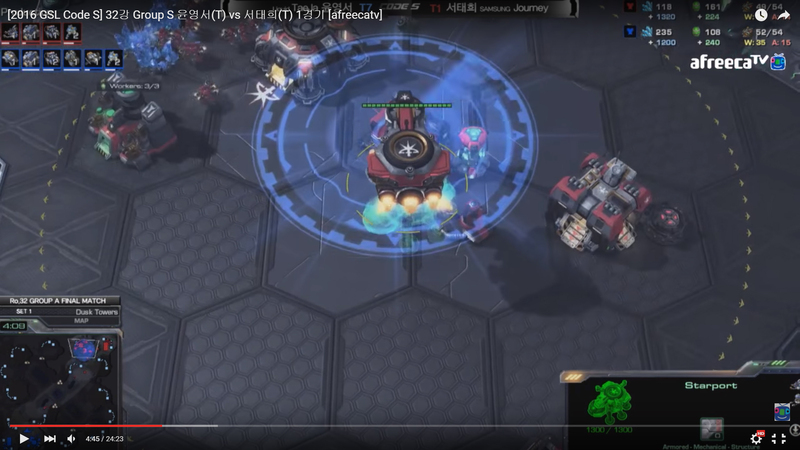 Journey, who was using the metagame Reaper opening, had his Factory and Starport completed before Taeja’s. Thus, Taeja has to play the match up as a defender and not an offender in the early game. If Taeja can play this out until the standard Tank Medivac mid game without taking damage, he is ahead. Journey is the offender, while Taeja is the defender. Taeja sets himself up defensively with Cyclone, Viking and Engineering Bay. Journey scouted Taeja’s gasless opening by deduction, and he knew he had the choice of being the offender. Hence, Journey had made only offensive investments by getting Cloaked Banshee after he already invest in an early Marine, Tank and Medivac attack. Taeja also played out his defender role well by playing defensively by default and scan to deduce what offensive treat he needed to prepare for. Just to be clear, Journey’s Scv scout could not tell if Taeja was going for gasless expand or gas first (second Supply Depot timing and the number of Marines). Journey was smart to put down the Tech Lab immediately after the Factory is completed instead of making Widow Mine or Hellion, because this gives him the option of making Cyclone and Viking if Taeja was actually going for a gas first opening. After his Reaper had found its way in to know that Taeja was going for a gasless expand (deduced from the delayed tech), he chose to make Tank and Medivac. In the game, the timing of Taeja’s Tank lines up well against Journey’s Tank push, as it appears in time when the Journey’s army reaches his base. Journey already got the quickest Tank possible with the Reaper opening (without sacrificing Marine production), as he put down the Tech Lab immediately without producing anything from the Factory. While Taeja could have done better in executing the battle defensively, how the timing lined up for both builds shows that a gasless expand may just be playable under certain circumstances. Taeja’s opening choice has gotten some attention for sure. In case you are not aware, an one Barracks gasless expand into two gas for 1-1-1 was one of the first metagame economical build in Wings of Liberty. It was popularised by both Mvp and MarineKing (both were the best Terran at that time). Just to show off my knowledge and memory, MarineKing actually squeezed in a second Barracks after getting the two gas, but the mineral difference actually does not allow you to produce from the Factory and Starport immediately. There are two ways to react to a build that is more economical than yours. Clearly, Journey went for the first option, which is also an option that many players would consider. There is nothing wrong with it, but some forget that they do not know opponent’s opening until they scout it and this leads to a wrong direction of thinking. There is a recent post on /r/allthingsterran asking about reaction to economical build, and the comments show just that. One suggested a gas first opening into an aggressive Reaper and Hellion build, and another also suggested aggressive openings like proxy Barracks Reaper. You would have to decide the opening (gas first or proxy Barracks) before you have scouted opponent’s economical opening, so these suggestions are not helpful. Although you cannot adjust your opening, you can adjust your subsequent build after you have scouted opponent’s economical opening (there is a difference in opening and build order). Again, I want to link the previous discussion on how to react to economical build here, because it is extremely important for this discussion. As I have mentioned earlier, there are two reactions: more offensive or more economical. So you either shift the build order interaction to your advantage with “offensive > economical” or “economical > defensive”. The choice should not only be based on your preference, but also your opening itself. Some openings may do better in one choice than the other. Using Journey versus Taeja’s example above, it may be better for Journey to pick the “economical > defensive” path. This is because the current Reaper expand opening does not have a strong offensive early timing, since it is an economical-oriented opening to begin with. Journey’s reactive build order choice is perhaps the best you can do if you want to pick the “offensive > economical” path, but it apparently is not as punishing as one may assume. Perhaps it is relatively easy to get ahead by picking the “economical > defensive” path with the current Reaper expand opening, but this is definitely up for debate. If you manage to scout opponent’s opening early (no wall off to deny your Scv scout), you can decide not to get the second gas and put down the third Command Centre quickly. If you have already taken the second gas, which is the most likely situation, you can consider taking workers off one Refinery for an earlier third Command Centre. The opponent’s defensive investments like Cyclone, Viking and Engineering Bay will not serve their intention well, and their counter attack potential is weak. This should get you ahead in the mid game Marine, Tank and Medivac battle, ceteris paribus. Previous Is Mech Viable? Or should it? Love your work you are making terran great again. Is offender/defender an aussie thing vs. attacker/defender? Haha. This may be due to the fact that I have following NBA recently. You call it an “offensive” foul/rebound etc. So, indirectly, you can say it is an American thing.